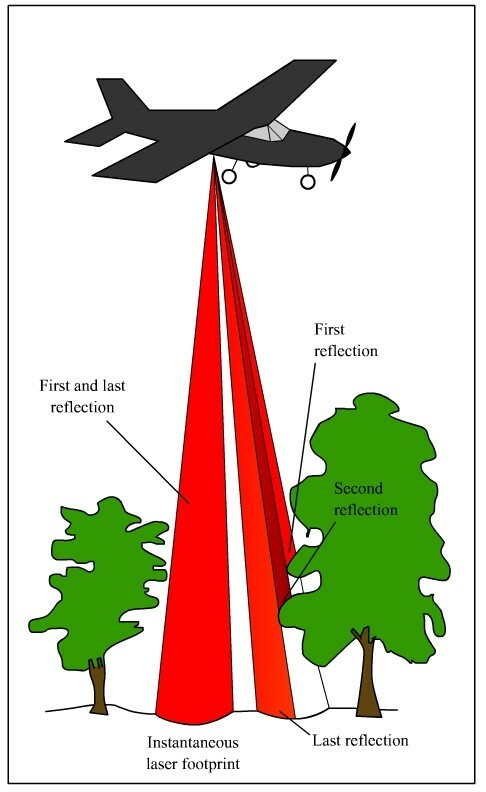 LIDAR is an optical remote-sensing technique that uses laser light to scan the surface of the earth, producing highly accurate spatial data (Figure 1). 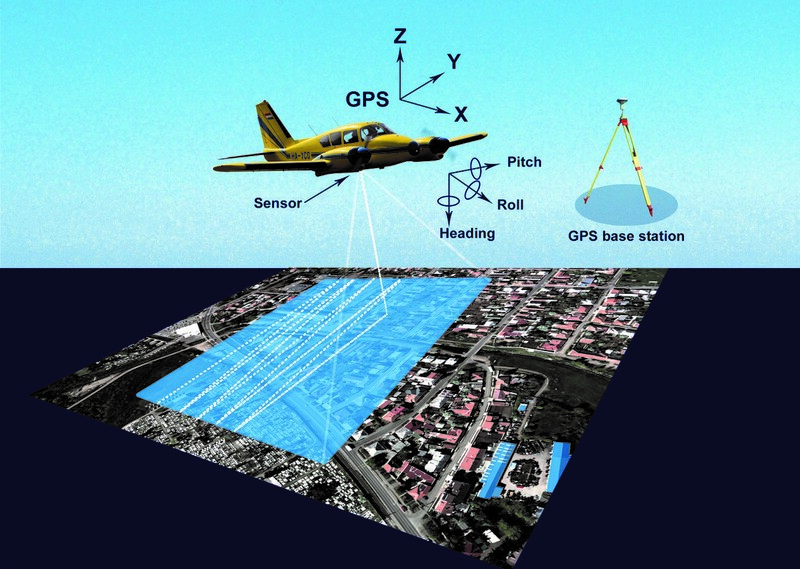 LIDAR, primarily used in airborne laser mapping applications, is emerging as a cost-effective alternative to traditional surveying techniques such as photogrammetry. The major hardware components of a LIDAR system include a collection vehicle (aircraft, helicopter, vehicle, and tripod), laser scanner system, GPS (Global Positioning System), and INS (inertial navigation system). An INS system measures roll, pitch, and heading of the LIDAR system. LIDAR is an active optical sensor that transmits laser beams toward a target while moving through specific survey routes. The reflection of the laser beam is detected and analyzed by receivers in the LIDAR sensor. Laser pulses emitted from a LIDAR system reflect from objects both on and above the ground surface: vegetation, buildings, bridges, and so on (Figure 2). The perspective images without distorsions are called orthophotos. When they are digital they are called digital orthophotos. If the images are referenced into a coordinate system, then we talk about orthophoto maps or digital orthophoto maps. The first step in digital orthophoto production is to take aerial photographs of the land surface. The orthophotos are the final product after the cutting of georeferenced, orthorectified and moisiacked images. The aim of aerial hyperspectral imagery is to collect data with high information content and field resolution about our environment. Therefore one such image may be suitable for determining material or biophysical properties that would not be possible using traditional aerial imagery. 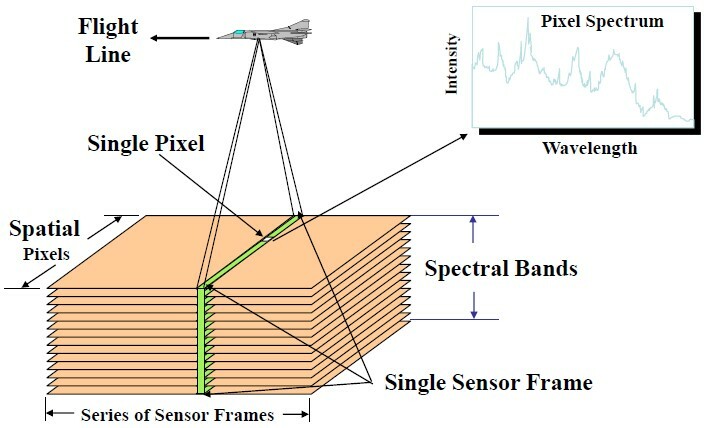 This is due to the fact that a hyperspectral sensor collects data in a much wider wavelength band, so it includes ranges invisible to the human eye (Figure 3). Until recently hyperspectral applications stayed within the limits of research, nevertheless nowadays more sand more practical uses of aerial hyperspectral imagery appear in the field of botany, agriculture, environmental protection, military, disaster management and other fields requiring detailed environmental data. The geographical scope of the project was Hungarian and Slovakian Sajó valley sections. The total surveyed area was 311 km2. The project was set up following the flooding of 2010, when Hungary experienced a record rainfall in May and June and consequently a nation-wide flood came about on smaller and larger rivers. The most affected areas and settlements were in the Sajó valley. An approximately 100 year return period flood wave arrived to the Hungarian border in June 2010 that increased to a once-in-200 year flood on the lower parts of the river. The Sajó River connects common interests in its catchment on the two sides of the border. The protection of the river, the common use of water resources, the environment-, nature-, and flood protection are a public interest. Tasks specified in the river basin management plans necessitated a standardized survey of the Sajó River and its environment to the proper water-course maintenance planning, the hydro-meteorological forecast development, the operational preparation of the flood control, and the planning of the water management, environmental protection and nature conservation. The Sajó valley airborne laser scanning and aerial digital imagery have been made on 121 km2 area in Hungary (17th June 2013), and on 190 km2 area in Slovakia (17-18th July 2013). The LIDAR measurement simultaneously was measured with aerial digital survey in 15 cm geometric resolution in RGB and NIR colour composition. The average point density of the LIDAR survey was 5 point/m2. Ground based data collection was made on 24th June 2013 at the Hungarian site and 20th July 2013 at the Slovakian site (Figure 4). The hyperspectral images were made in the visible and near-infrared range (VNIR). The recording was made in 1.5 msampling in the full bandwidth (400-1000 nm), therefore each pixel contains 128 spectral channels. The survey has been made on 20th August 2012 in Hungary area of interest. In this case study the presented measurement methods and technologies could successfully be adapted to survey other similar water-related, flood-control-related and water management-related geographical areas. 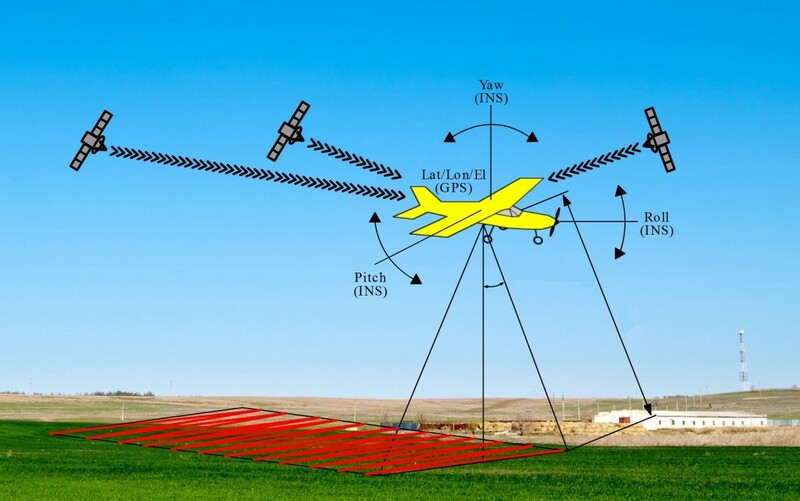 The applied aerial and ground based technologies and devices are not site-, territory- or country-specific thus these could be adopted for almost any locations, floodplains or river valleys. In addition, the know-how for the data processing and classifying exists and is continuously improving. The applied technologies and their results achieved the expected goals of the project, thus water management professionals can use and use the resulted data sets, maps and models in flood-control related and water-related decision making methods and practice alike. Advantages of the applied technologies: fast and highly accurate data collection from a huge area, cost-effective measurements to traditional surveying techniques, collecting high precision topographic data even under dense vegetation and gathering high spectral width data (400-1000 nm spectral range).